How evolved are you? New book for kids tells all! Home » Books » How evolved are you? New book for kids tells all! 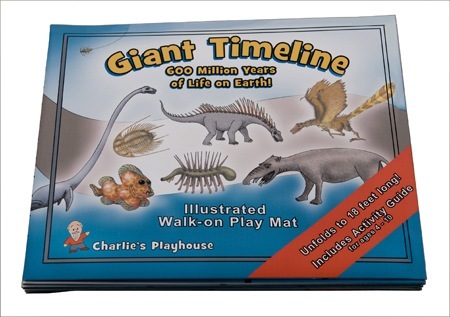 The Giant Timeline is a new book out by a new publisher, Charlie’s Playhouse, which makes books and toys to teach kids about evolution and natural selection. The Giant Timeline is an 18 foot long unfolding book that takes the reader through the past 600 million years of history of life on this planet. The book is big, big, big, like its subject matter, but makes the story compelling to kids 4+ with colorful illustrations, comic book-like thought bubbles from the funny creatures, and lots and lots of strange looking monsters who have the distinction of being our ancestors. Dads will find a lot to love about this book. It’s a perfect length for a before bedtime read, but also fills in tons of knowledge gaps for the non-scientists among us who haven’t studied the evolution since high school (where my teacher scoffed at it by the way). My son and I both read the book together and enjoyed the colorful illustrations. The book also contains page after page of explanatory material which provides background information and even games for the deeper involvement in the timeline, with ideas for kids, parents, and teachers. I’ve never seen such an in-depth study guide in a book of this type. The Giant Timeline has taken the coveted “favorite book” of my five year old son. He loves is so much that he immediately took it to school to show his kindergarten friends. The publisher of the book, mom and scientist Kate Miller, admits that evolution can be controversial. Charlie’s Playhouse, however, believes that the majority of Americans find the study of evolution consistent with their own beliefs and that the issue if over-politicized. “Why should this majority be deprived of educational fun stuff for their kids because the few who politicize the issue. It’s basic cultural literacy.” To this end, Charlie’s Playhouse has teamed up with The Clery Letter Project which gathers signatures from clergy affirming their belief that evolutionary study is consistent with their religious beliefs. Find this book and other toys of an evolutionary nature at Charlie’sPlayhouse.com. One last thing, while the book smells a bit like plastic out of its packaging, it’s actually made out of a earth-friendly synthetic paper called Polylith.